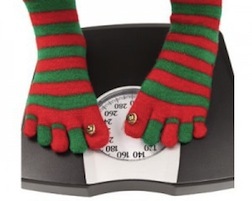 How much weight do you think the average person gains over the holidays? I guessed about 5-10 pounds. I was wrong. According to a 2000 study in the New England Journal of Medicine, people overestimate how fattening the holidays are. We think we're likely to gain at least five pounds, while the actual gain is closer to one pound. Perhaps holiday weight gain has increased since 2000--it hasn't been formally studied lately--but I bet it hasn't. I routinely see patients who tell me that they don't want to have an annual physical or get their cholesterol checked until at least February or March "so I have time to recover from the holidays," but do just fine if they come in earlier. There's no question that this can be a challenging time of year health-wise. Shorter days and icy streets can make exercise more difficult; numerous parties and a non-stop stream of food in the office from Halloween until after New Years throws healthy eating off track; the financial and emotional stresses many experience over the holidays can send us straight to the egg nog or latkes for comfort. But I do wonder if our change in behavior this time of year may involve a self-fulfilling prophesy. We've decided in advance that weight gain and poor health are inevitable and sometimes they do occur. Turns out they're not inevitable, though--or at least likely not to the degree we might think. But, that measly one pound we gain over the holidays? Most people never lose it. And after a decade or two of Decembers, it adds up.